This Pirate Sunken Island Map Cartography Skull Statue is 6.5" tall 8.25" Long and 6" Wide approximately. This Pirate Sunken Island Map Cartography Skull is made of composite resin hand painted and polished individually. Color tone may vary from pictures. This relic treasure skull bears a secret map on its surface that reveals a lost sunken island with unlimited treasures. The skull contains unsolved mysteries and warns of treacherous parts of the world that you will need to conquer before you finally locate the island of endless treasures. 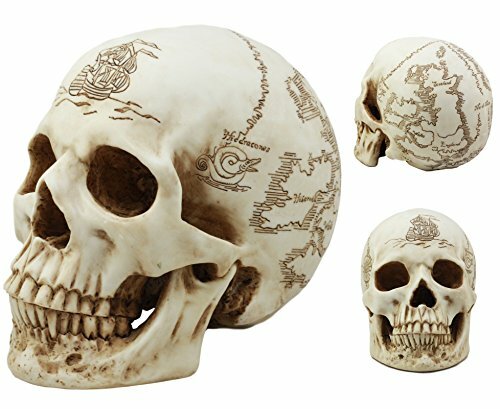 Own and display this cartography skull in your home or gift it to a loved one! Beware of pirates! They will steal this skull from you! This Pirate Sunken Island Map Cartography Skull Statue is 6.5" tall 8.25" Long and 6" Wide approximately. This Pirate Sunken Island Map Cartography Skull is made of composite resin hand painted and polished individually. Color tone may vary from pictures. This relic treasure skull bears a secret map on its surface that reveals a lost sunken island with unlimited treasures. The skull contains unsolved mysteries and warns of treacherous parts of the world that you will need to conquer before you finally locate the island of endless treasures. Own and display this cartography skull in your home or gift it to a loved one! Beware of pirates! They will steal this skull from you!